China has put high-voltage direct current (HVDC) transmission on the front burner, but growing wind and solar power and grid constraints are leading to projects around the world as well. China may be the single biggest driver in high-voltage direct current (HVDC) power grids, but we’re still seeing the technology bridge hard-to-cross barriers in other countries as well, whether in the San Francisco Bay, or across the Red River that divides the Texas (ERCOT) and Oklahoma (SPP) power grids. Right now, those two grids are tied together by the 30-year-old “Oklaunion” HVDC link power exchange facility -- a testament to the fact that using direct current is not a completely new trend. On Tuesday, Swiss grid giant ABB announced it had landed $60 million from American Electric Power (AEP) to bring the Oklaunion station up to modern HVDC standards. That includes the ability to transmit up to 220 megawatts of power in either direction, as well as provide “black start” support for the devilishly complex task of bringing a blacked-out grid back to an energized state, bit by bit. Direct current lost the war to alternating current as the core technology behind the world’s modern power grids more than a century ago. But it’s still a more efficient way to move power over long distances, with about half the line losses of a comparable AC system (and close to zero line losses, if you bring superconductors into play). That’s given it a longstanding role in the power grid for high-voltage connections, such as Oklaunion, or the 3,100-megawatt Pacific DC Intertie between California and Oregon, or the HVDC Inter-Island link connecting the north and south islands of New Zealand. But these links are under increasing strain. Big demand response provider EnerNOC, for example, has a program to help New Zealand’s power-hungry North Island and its hydropower-rich South Island balance load to keep their exchange of electricity within the constraints of the current HVDC cable connecting them. Last year, ABB won a $20 million contract to refurbish the Highgate converter station connecting Quebec and Vermont, one of several links that tie U.S. and Canadian grids together. Meanwhile, direct current technology has been adapted to serve lower-voltage functions. At the extreme end, companies like General Electric and Nextek are building DC “microgrids” at data centers or research facilities, which leave AC out of the equation completely, either fed by big power converters via the grid or internally with DC power sources like solar panels, batteries, fuel cells and the like. In Asia, South Korea is investing heavily in HVDC, both for congested grids in Seoul or on its Jeju Island smart grid test bed. 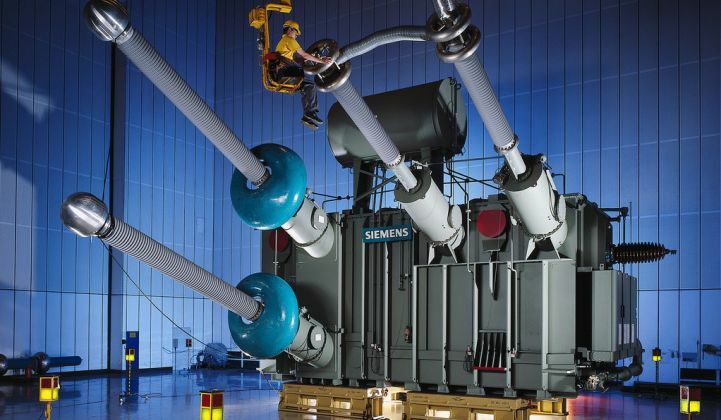 In California, Siemens has debuted its “HVDC Plus” technology for a 53-mile cable carrying 400 megawatts under San Francisco Bay, from Pittsburgh, Ca. to San Francisco. ABB, for its part, built the first 200-mile, 100-kilovolt, 20-megawatt DC line in Sweden in the 1950s, and now has more than 70 projects around the world, with a total transmission capacity of more than 60,000 megawatts. Last month it announced it had tested a 1,100-kilovolt DC line, the highest voltage yet reported. ABB also has a record for longest HVDC line, the 2,000-kilometer long, 800-kilovolt Xiangjiaba-Shanghai link, with a capacity of 6,400 megawatts. Indeed, China is by far the biggest consumer of HVDC technology. The government has said it wants to spend $269 billion through 2015 on building about 200,000 kilometers of new 330-kilovolts-and-up transmission lines -- almost the equivalent of rebuilding the United States' 257,500-kilometer transmission network from scratch. Of that, State Grid Corp. of China plans to spend a staggering $80 billion on 40,000 kilometer of ultra-high voltage (UHV) DC lines from 2011 to 2015. All told, HVDC will make up 40 percent of the country’s 300 gigawatts of new transmission capacity, according to GTM Research in its recent report, The Smart Grid in Asia, 2012-2016: Markets, Technologies and Strategies. In return, China will get much lower line loss and increased transmission capacity per powerline corridor, for a cost benefit of some 30 percent compared to deploying a comparable AC system, according to GTM Research. The same sorts of equations have led to HVDC being deployed for such extreme tasks as linking hundreds of megawatts of North Sea wind power to shore in Northern Europe. Both ABB and Siemens have plans to connect gigawatts of offshore wind via HVDC (PDF), though Siemens has also faced stumbling blocks with its chosen technology that have led to reduced profits and a reshuffling of its power transmission business earlier this year. HVDC is also an integral part of the Tres Amigas project in New Mexico, an estimated $1.5 billion plan to link the United States’ three main grids, Eastern, Western and Texas, via a triangle of high-voltage cables backed by batteries from Xtreme Power and a market management system from Viridity Energy. That project recently raised $12 million from Japan’s Mitsui & Co., which is also working with a host of Japanese partners on projects to help Japan deal with its post-Fukushima power shortage. One big restraint is Japan’s separate northern and southern grids, which run on different frequencies. These are linked in an HVDC installation first turned on in 1965, and upgraded since then -- but today’s technology could offer increased grid-balancing features that may make it worth another upgrade.